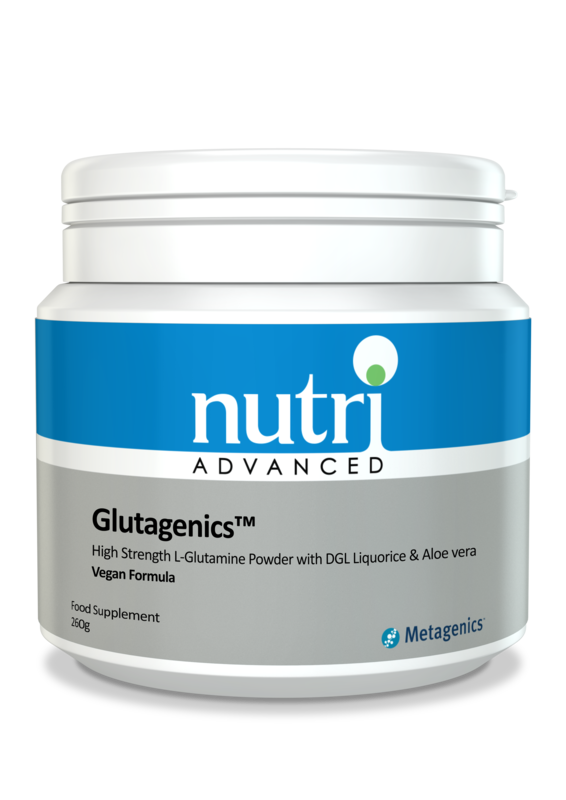 Nutri Advance Glutagenics features glutamine, deglycyrrhizinized liquorice (DGL), and aloe vera - to support the integrity and optimal function of the gastrointestinal lining. Glutagenics™ features three key ingredients - glutamine, deglycyrrhizinized liquorice (DGL), and aloe vera - that comprehensively support the integrity and optimal function of the gastrointestinal lining. * Proprietary extraction process removes the laxative bitter principles, confirmed by thin layer chromatography (TLC). Equivalent to 10g of aloe leaf gel. Features: Supports a healthy intestinal lining, which is essential for healthy digestion, immune function, liver function, and overall health. Supplies high levels of the amino acid glutamine, which provides both a source of fuel and precursors for growth to the rapidly dividing cells of the intestinal lining. Provides a concentrated liquorice that has been processed to remove glycyrrhizin, reducing the risk of adverse effects associated with liquorice. The processing and removal of the bitter principles in aloe prevent a laxative effect. Powdered form for ease of use and flexible dosing. Recommendation: Mix 1 teaspoon with water 3 times daily, or as directed. Caution: Not recommended during pregnancy or whilst breastfeeding.